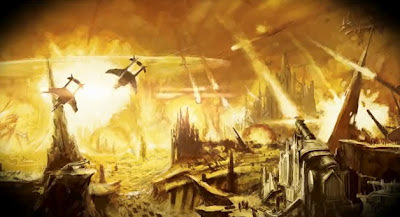 We all know Flyers are one of the biggest changes to the game with 6th edition 40k. What's interesting is how the impact of Flyers continues to evolve from the initial release of the rule book with each new codex that gets updated. I remember reading a number of articles on what people thought of the new Flyer unit type and how it would shape the game we all know and love. Early on, only a small handful of armies actually had access to flyers and while Allies certainly opened up those options to other books who didn't have any, it still took time for players to begin regularly incorporating them into their lists. For a little while there you could probably get away with #3. But now, having 4 books updated to 6th and each bringing with them even more Flyers, that seems less and less like a viable strategy -- maybe if you have a massive horde army that can occupy a huge portion of the board and basically make it so Flyers can't fit... still a huge investment in time and money in order to have enough models to even pull this off, plus you run into time constraints being able to make it through a full game at a tournament with that many models. Moving on to #2, Fortifications, or namely the Aegis with gun emplacement -- also a pretty big change to the game. This was a much needed band-aid of sorts during a time when virtually nothing outside of an actual Flyer had the Skyfire ability. The ADL + gun is certainly a nice addition to an army, although mostly for the cover saves it provides. The gun rarely lasts an entire game and when it's the only anti-air gun in your list against a Flyer heavy list, you can guarantee it will be shot to death as soon as possible. Enough time has passed with 6th edition and we can tell by looking at the results from some of the more recent GT's... having only 1 gun with Skyfire isn't going to cut it. At least not against the likes of Cronair / Vendetta / Helldrake-FMC spam etc. I'm not advocating that you build your list solely to take on 9 Nightscythes or whatever -- even that sort of list has to give up a lot in other areas of their army to even field that many, and I certainly wouldn't call those lists balanced. What I'm noticing is that to build a well balanced, 'all-comers' army to compete in a tournament you must account for how your army can react to a Flyer-heavy match up. For most, that may simply be including more Flyers in your own lists or maybe you're lucky enough to have the option to include some of the newer units that have been granted access to the 'Skyfire' rule. I know as each codex gets updated, this will become less and less of an issue. For some armies, these updates can't come soon enough. I can't wait to get my hands on the new Eldar codex to see what options they will bring for dealing with Flyers. It's an area my Dark Eldar have a very tough time with so I'm hoping their only Battle Brother can shore things up for them. They are also the reason each of my army lists (including the most recent one from last week) doesn't begin with a Razorwing Jetfighter and ADL + gun, as these are the only 2 options I currently have available to my DE. Those 2 things just don't feel like enough if I'm trying to make my list an 'all-comers', so I haven't even bothered writing them in yet until I see what else will be available once Eldar drop. It is kind of sad that some books have to rely on Allies for this sort of thing but for now there really is no way around it. I do hope that between the new Tau and whatever Eldar get that we see a rapid departure from the crazy airforce lists that have been dominating recent events. How many Flyers / Skyfire units does it take to make a truly balanced list in our current environment? What general rule of thumb do you use when you write a list that you intend to use at a tournament? For me it depends greatly on the composition of the list. If I'm taking Space Marines, I'm going to likely ally with IG since I'm running Astral Claws. Running 2 Storm Talons with the skyhammer missile launcher and a vendetta gives me enough dakka to hurt night scythes effectively, and a lot of rolls on heldrakes vendettas and storm ravens. I like to have 3 skyfire units in a list, although weight of twin linked fire can mitigate that. If one of the flyers is expensive, 2 flyers will suffice. When I run my Lamenters with my Astral Claws I run 1 Storm Raven and 1 Storm Talon. If I can fit in the points I add an aegis and quadgun to shore things up. For Nids I have a flyrant I'd love to take a second and then use the hiveguard as a last ditch source of S8 (each squad has 3 S8 Assault 2 models) as they will likely hit at least once per squad fired. For CSM I try to stick to 2 heldrakes, one with the baleflamer one with the hades. Vector Strikes + S8 is nice. If you take daemon allies, a herald of tzeentch is 45 points and is already mastery level 1. You can literally just use him as a dedicated divination platform. Stick him in a squad of pink horrors, stick them behind an aegis, and you can go to ground behind it with rerollable 1's. You can even spend another 100 and take a squad of bloodletters to man an icarus lascannon (BS5 is nice on that thing), or if you want to cheap out stick to the herald in his squad. 135 point allied detachment + 100 point aegis = 235 for anti-air shooting, a scoring unit, and the ability to twin link another unit, such as a heldrake with a 4 shot S8 skyfire autocannon. That said I don't really use tzeentch with my lists, but I might for pure Red Corsairs, its so affordable. I do think 2 storm talons and a quadgun are enough for a pure SM list. Or, maybe not enough, but the most I'd spend. I'm not sure who'd man it either. Putting a master of the forge on it isn't an altogether bad idea, although i'd shave it to the icarus lascannon there since BS5 makes it more dangerous. That's about all my experience, limited to my armies as it is lol. Nice breakdown on each of your armies, and very good point about twin-linked weapons! They can certainly be effective against Flyers -- rifleman, 3 MM attack bikes twin-linked from Vulkan or Prescience... I'm sure there are a lot more combo's with psychic powers that are worth exploring.